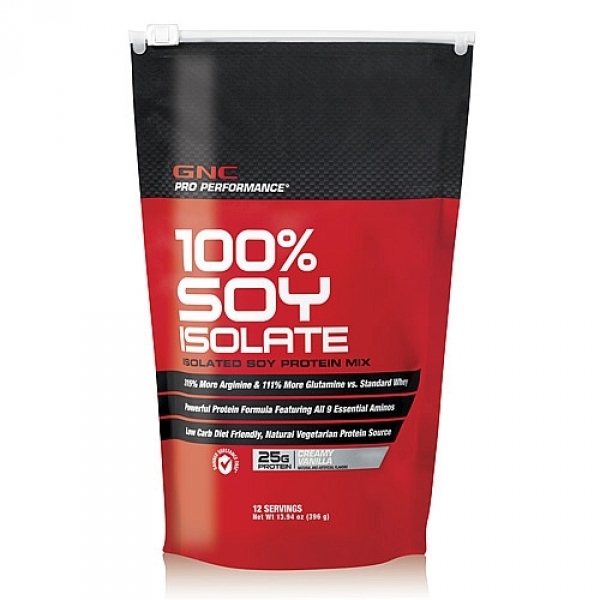 The dosage chart on the label is a recommendation by GNC Scientists for the best results from 100% Soy Isolate. It is recommended that the minimum daily dose is taken on each day based on activity level. Pro Performance® 100% Soy Isolate is a protein shake that is cholesterol-free, with no lactose, and is from vegetarian sources. Soy protein is one of the most anabolic proteins. One of the biggest misconceptions behind this protein is the link to estrogen production; however, it contains all of the essential amino acids, including BCAA. BCAA may help preserve muscle glycogen stores and reduce the amount of protein breakdown during exercise. This formula features Supro® soy protein, one of the most clinically studied so proteins. Supro® is made from soybeans that are produced while being tightly monitored and controlled from planting through processing. Protein is an essential nutrient that is necessary for the growth, repair and maintenance of body tissues such as skin, bones and muscles. Studies have shown that soy protein taken by active individuals helps support muscles during exercise. Additionally, diets low in saturated fat and cholesterol that include 25g of soy protein a day my reduce the risk of heart disease. One serving of Pro Performance® 100% Soy Isolate features 25g of protein providing an equivalent nitrogen factor of 25. Soy Protein is an effective source of nitrogen for fueling lean muscle mass. Your muscles can only grow when your body retains enough nitrogen. This formula delivers naturally-occurring anabolic amino acids into your bloodstream. This spike in aminos provides nitrogen and subsequently creates a nitrogen-rich environment needed for maximum muscle protein synthesis. Protein synthesis is crucial to the building of lean muscle mass. GNC Pro Performance® 100% Soy Isolate is also tested for banned substances,* providing peace of mind in the highest quality formulation. Our researchers created a superior formula that not only delivers muscle fueling results, but every flavor has a satisfying, delicious taste profile. Each serving mixes up instantly with a blender, shaker, or a spoon- It’s that smooth and it couldn’t be easier.